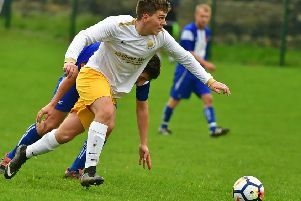 Junior footballers from Savile Town FC are set to benefit after the club secured sponsorship from O2 Dewsbury for the next two seasons. O2 Dewsbury will support the club as their team battle it out in the Huddersfield Junior Football League. Savile Town FC run an academy for children aged four to eight year olds and have junior teams from Under-8s through to Under-15. A number of the club’s teams have won their respective leagues and cup competitions in previous seasons. Zakir Patel, managing director of O2 Dewsbury, said: “We wanted to contribute in someway towards helping grassroots football. “There is so much money in football these days but not enough of it finds its way down to grassroot level. “I played for Savile Town seniors many years ago and now my children play for the club’s juniors, so I know first-hand the benefits of them being involved with a friendly and supportive club. “I was more than happy to offer my support by sponsoring the next generation of Savile Town Football Club players. “Junior football teams enable children to hone their skills and keep fit. Savile Town chairman Imtiaz Ameen is delighted the club have secured sponsorship and added: “It’s fantastic that a local business wants to support junior football. “Without the support of people like Zakir, we wouldn’t be able to give so many children living locally the opportunity to play football.